Cold Dog Soup is a 1990 film directed by Alan Metter. 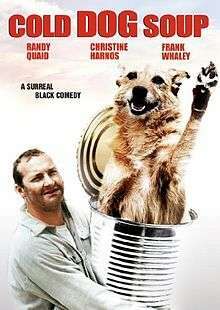 It is based on the novel Cold Dog Soup by Stephen Dobyns. Randy Quaid plays a Zen taxi driver whose passenger is trying to dispose of his date's dead dog Jasper. The driver is respected by the peculiar groups he interests in the dog's corpse and effects, and the one-gloved heroine becomes more interested in him than in her date.